Opera Prelude would like to thank the Ambache Charitable Trust for their incredible generosity and support for this event. As part of the Season devoted to women and their role as composers and the inspirations for operatic pieces, we bring a work by a lady who filled both of those roles. Pauline Viardot was a key 19th century singer, inspecting roles and music from her composer friends Berlioz, Chopin, saint-saëns and Meyerbeer. She devoted herself to not only creating new roles, but historical research into music of the baroque and classical periods. Her salon performances enabled listeners, such as Dickens and Chopin nonetheless, were never dull as she programmed such a wide variety of musical works including her own. Pauline was a mezzo-soprano and daughter of the infamous singing pedagogue Manuel Garcia – an infamous tenor himself! Pauline wanted to be a concert pianist, having had lessons with none other than Franz Liszt, but her mother pushed her towards a singing career. Always an enthusiastic composer, Viardot retired from singing and presided over a music salon until 1883. Her works were mainly written for her own pleasure and had no ambitions as a serious composer. She did however write three salon operas alongside hundreds of songs. In Cendrillon, Viardot takes Perrault’s famous Cinderella story and makes it her own. The music is ironically nostalgic of 19th century France and conjures images of Cinderella, the downtrodden girl, in the midst of it all. Opera Prelude returns to the ideal surrounds of Leighton House for this sparkling concert performance. Tickets £40 to include programme and interval glass of wine. Prévost’s L’Histoire du chevalier des Grieux et de Manon Lescaut made an outrageous appearance on the literary scene in 1731 detailing the exploits of the young, beautiful, and morally incorrigible Manon. Banned in France for its scandalous depiction of this unrepentant libertarian of a woman the novel became very popular and pirated editions were widely distributed. Manon’s love, won and lost with the wheel of Fortune, is presented as capricious, addictive and impossible. Indeed, upon reading Prévost’s novel in Dumas’ La Dame aux Camélias, Marguerite Gautier, better known operatically as Violetta Valéry, declares that “when a woman loves, she cannot do as Manon did”. However, she too eventually abandons her lover and both fallen women succumb to their inevitable fate – an early death. Anna Beer is a cultural historian and writer as well as Visiting Fellow at the University of Oxford. 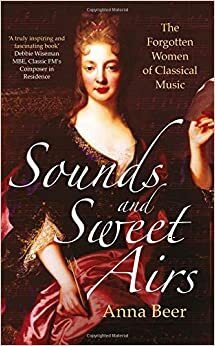 She has recently published a long over-due book: “Sounds & Sweet Airs: The Forgotten Women of Classical Music” celebrating the musical legacy and hidden histories of eight remarkable women composers. From 17th century Florence to 20th century London, they created their music in public and private; in the Courts of the Medici’s and Louis XIV; they wrote what they could, when they could whether it was for the glory of God, their patrons or family. In this morning’s lecture recital, Anna will introduce us to some of these inspirational women with accompaniment from Opera Prelude’s young artists. Her book has rece ived nothing but wonderful reviews from The Guardian to the Financial Times to The Wall Street Journal. Publishers Weekly writes: “Absorbing … [Beer] writes with rich detail and sympathetic insight about [these women’s] ambitious, adventurous battles to overcome barriers to creativity.” There will be an opportunity to purchase a book and have it signed by Anna Beer. Now in its fourth year, The Opera Prelude Song Prize offers one of our young singers the unique chance of private Masterclasses with Della Jones, one of Great Britain’s leading mezzo-sopranos. We are most grateful to her for the generosity she continues to show Opera Prelude’s young singers and also for the generosity of our anonymous donor who has made this prize possible. Join us for the finals of our Song Prize and await Della’s choice of winner which will be announced after the event! Past winners included Ricardo Panela (baritone), Callie Gaston (soprano) and Becca Marriott (soprano) who have all benefited immensely from private lessons with Della. If you would like to contribute to the continuation of this Prize, do please get in touch. An end of term talk and recital celebration with smoked salmon sandwiches and a glass of wine! The celebrated American painter John Singer Sargent (1856–1925) was also an accomplished musician and would often interrupt his work to play the piano. Throughout his career, Sargent cr eated portraits that intimated entire worlds, dramas or what Henry James often called “scenes”. This morning’s talk and recital of French music is inspired by scenes of summer and Sargent’s famous picture Carnation, Lily, Lily Rose which was conceived during a boating expedition on the Thames in 1885 when the artist saw Chinese lanterns hanging among trees and lilies. Painted en plein air in the late summer of 1885 and 1886, and named after a popular song, its style links French impressionism with English pre-Raphaelitism and captures the transient quality of “fugitive evening light.” The refrain of the song asks the question ‘Have you seen my Flora pass this way?’ to which the answer is ‘Carnation, Lily, Lily, Rose’. Tickets for this lecture will be £35 to cover the cost of the extra singers taking part and lunchtime refreshments! After an attempt to expose the crimes of the corrupt prison governor Pizarro, Florestan finds himself unjustly imprisoned and in mortal danger. Amid rumours of his demise only one person, his wife Leonora, suspects the truth. Disguised as ‘Fidelio’, a male prison guard, she embarks on a valiant attempt to rescue her husband from certain death. A deeply moving story of love and faith, Fidelio is a tale of personal sacrifice, heroism and human aspirations for justice. With its themes around incarceration and illegal detainment, Beethoven’s only opera has resonated with audiences across borders for decades, and still feels eerily relevant today. For Powder Her Face at the Royal Danish Opera, director Orpha Phelan and designer Madeleine Boyd won Denmark’s prestigious Reumert Award for Best Opera Production 2016. They join forces again for this new production of Fidelio, asking what could drive one to deny freedom from another – and what imprisonment and longing mean to all of us. Full of favourite festive pieces, mesmerising harp solos and songs that dream of white Christmases and starry winter skies. The diverse programme featuring Schubert’s Ave Maria, Howard Blake’s The Snowman, Tchaikovsky’s Sugar Plum Fairy and some of the most atmospheric songs from Strauss, Schubert, Debussy and Faure, reflects the long nights, dreamy snowscapes and joyful Christmas tales of winter. After the success of The Russian Voice, soprano Sophie Pullen returns to the Kino Teatr with Finnish mezzo soprano Amanda Martikainen and pianist Helen Ridout to explore the stranger-than-fiction characters that propel opera’s most fantastical tales. They’ll show how Voltaire, Pushkin, The Brothers Grimm, and many more famous novelists have had their work influenced, and occasionally swallowed up, by the world of classical music. Join us to find out which eminent composer’s pants fell down in the presence of Tsar Nicholas, which Italian soprano’s lover died in our very own White Rock Pavillion and why Offenbach’s famous Barcarolle should be sung in Russian… A mischievous romp through history with music by Donizetti, Tchaikovsky, Bellini, Bizet & Bernstein in the magical setting of Kino Teatr. The celebrated American painter John Singer Sargent (1856 – 1925) was also an accomplished musician and would often interrupt his work to play the piano. Including music by Rachmaninov, Liszt, Tchaikovsky, Schumann, Mussorgsky, Bellini & Grieg. 5 / 19 /24 September – Adina – L’Elisir d’Amore, Donizetti Barefoot Young Artists Opera Tour. Trouble in Tahiti is a rarely performed 40-minute gem of an opera. Leonard Bernstein wrote this opera between his biggest Broadway successes – On the Town, Candide, and West Side Story. Set in a suburban American town, the piece criticises post-war American materialism using several different musical styles. We are women – Bernstein, Candide. Tickets are £25. Email Lis.hasted@grosvenorchapel.org.uk or ring 02074991684 there should also be tickets on the door. “Can anyone think of a more wonderful way to celebrate the new year than through the glorious music of the strauss family? As well as wonderful waltzes and polkas mostly by Johann Strauss Junior, we will be joined by a brilliant young soprano – Sophie Pullen who will be singing some very well know songs from Strauss and Lehar, including arias from Strauss’ glorious operetta ‘Die Fledermaus’.